Sri Lanka's president signed six agreements to enhance "mutual co-operation" with Pakistan during an official visit to the country on Monday. 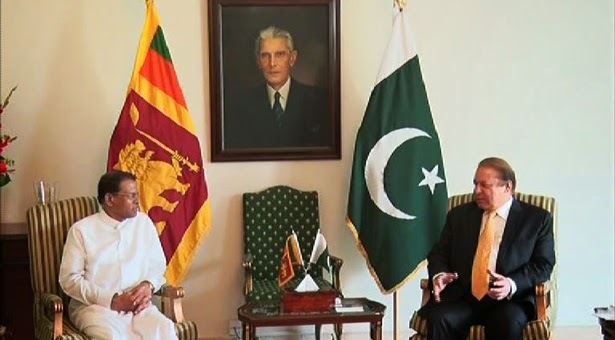 President Maithripala Sirisena met Pakistani Prime Minister Nawaz Sharif in Islamabad on Monday and agreed deals for co-operation on nuclear energy and to expand their trade volume to $1 billion. Sirisena also invited Pakistan International Airlines to resume flights to Sri Lanka, which have been suspended for the past year. Islamabad and Colombo enjoy a long defense cooperation, as Pakistan provided Sri Lanka with military hardware and arms during a decade’s long civil war with ethnic Tamil separatist rebels. “Sri Lanka is profoundly grateful to Pakistan for the strong support we received during our fight against terrorism,” said Sirisena. It seems that Pakistan want to get more ties in region against India and it may also lead to more economic growth as well. Sri Lanka can give investment opportunities which will not only make Pak Sri relationships better but as a rival of India, Pakistan can get more strength in regional politics.